From that wildfire comes Indowestern Gowns and lehengas, which are an amalgamation of Lehengas with western silhouettes and styles. Rose pink reception gown in heavy embroidery only. 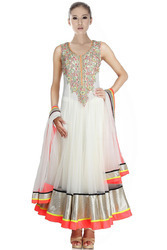 Irish green raw silk anarkali gown with embroidere. Embroidery work suit present in red and cream color combination used a good fabric to make that.